Ever since my conservation big year ended, I’ve been eager for the chance to enjoy the birds in my own backyard again. But 2014 is the wrong year for that—never before have Russ and I had as few birds as we’re seeing now. This winter we’ve had the fewest birds ever on Peabody Street. Every year, Ron Pittaway, an Ontario-based ornithologist, puts together a winter finch forecast based on a wide variety of variables. This year, he predicted that there wouldn’t be much movement of finches from Canada because seeds are so abundant up there. Spruce cone production has been huge up there, so he didn’t anticipate redpolls or siskins needing to move south much. Mountain ash berry crops are so abundant this year that Pine Grosbeaks aren’t expected to head our way, either. Pittaway notes that Evening Grosbeak numbers overall should be on the upswing as spruce budwork outbreaks are increasing—these birds have the highest reproduction success when they can feed their nestlings spruce budworm larvae—but extensive pesticide spraying to control the outbreak will greatly limit this food source. The birds may not be affected directly by the pesticides, assuming Canadian forest managers are mostly using Bt or toxins that specifically target invertebrates, though some insecticides affect neurological processes found in all animals. 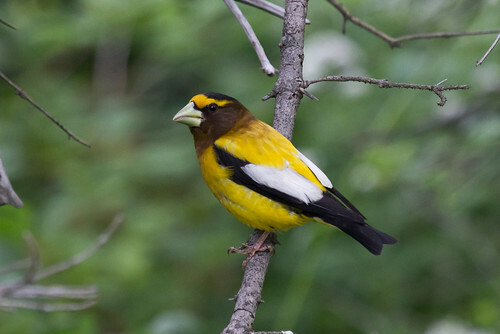 In this particular situation, the effect of the pesticides on Evening Grosbeaks is mostly secondary, wiping out their primary nesting food source. This is probably the primary factor that led to the decline of this beloved species. Even though we weren’t expecting many finches this year, it is troubling that there are so few. With irruptive species, one expects numbers to be boom or bust, but in previous decades the numbers at both ends of the spectrum were higher. Back when I always had dozens and sometimes hundreds of Evening Grosbeaks in my yard throughout fall, winter, and spring, even on slow days there were always a few. And even during poor winters, I could count on some redpolls showing up by now. 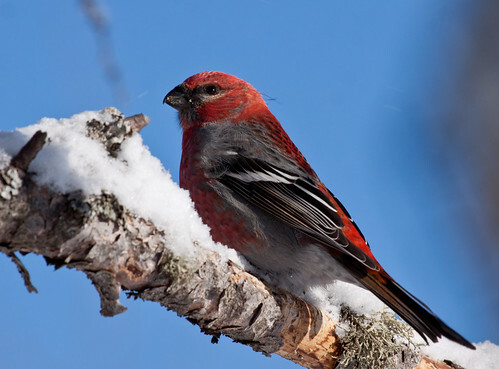 This year was the first time in 22 years that not a single redpoll was counted on Duluth’s Christmas Bird Count—sadly, there were no Evening Grosbeaks either, but that situation has become the norm now. It’s harsh enough to not be seeing winter finches, but in my own neighborhood other birds are being found in lower numbers than I can ever remember. I have one pair each of Hairy and Downy Woodpeckers, and one pair of White-breasted Nuthatches, but none of them are spending much time in my yard. 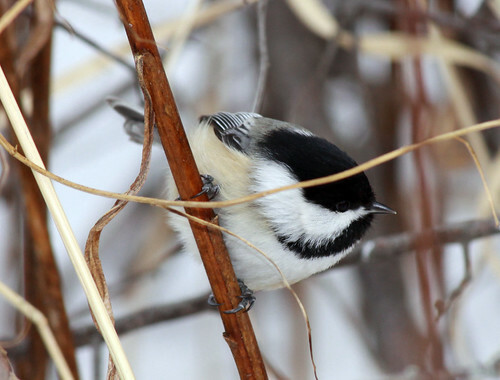 And chickadee numbers are way down—and they were down well before that extreme cold spell. Most of the time now when I look out the windows, I don’t see a single bird, and the only chickadee flock that does appear—not always even once a day—has only three or possibly four member chickadees. We may have lost them to West Nile Virus or something similar–chickadees in particular are exceptionally vulnerable to this disease. I’ve been noticing a slow but steady decline in the birds in my neighborhood for over two decades now. At first, people blew me off saying birds were just fine at their place in the woods, or that this was mere anecdotal information, and now most of us are resigned to low numbers as the new norm. But little by little we’ve been sacrificing the wild elements that made our quality of life so rich. The saddest thing is that the people we elect to positions with some control over policies that affect bird numbers never seem to have a clue about nature or how very much we’ve already lost. I hope we start getting more focused on environmental issues again before it’s too late. This entry was posted in Uncategorized on January 17, 2014 by Laura Erickson. In 1989 or 1990, when my daughter Katie was in kindergarten, my family took a trip to the Twin Cities and visited the Bell Museum of Natural History. I’d promised the kids that I’d get them their own copy of the National Geographic Field Guide to the Birds of North America when they got their life list up to 100 species, and Katie, my goal-oriented, competitive child, was gung-ho about seeing every species she could. When we saw the museum’s Passenger Pigeon display, her eyes grew wide studying the splendid birds, so huge and colorful compared to the Mourning Doves she knew so well. She told me she couldn’t wait to add that one, with its rosy body and blue wings, to her life list. When I gently told her that the Passenger Pigeon is extinct—that people had killed every one long ago—she broke down sobbing. I don’t know which emotion was stronger in her—sorrow that she’d never see a live Passenger Pigeon or impotent fury at the avarice and bloodlust of her own species, even though I didn’t get into specifics about the killing frenzies when gigantic flocks of Passenger Pigeons flew over eastern cities, many of which had to write ordinances prohibiting shooting pigeons within city limits because so many dead birds and so much shot was raining down on people below. I knew exactly how Katie felt, because when I was about her age, my grandpa told me about Passenger Pigeons. He was born in 1896 and had never seen one, but he remembered the stories his father and grandfather told him about what was once the most abundant land bird in the entire world. He told me stories about the huge flocks that blackened the skies, how when they descended upon a forest their sheer weight broke heavy limbs of sturdy trees. By the time he was a little boy, the last wild pigeons had been killed. Just one remained alive, a female named Martha living in the Cincinnati Zoo. When she died in 1914, he read about it in the newspaper. 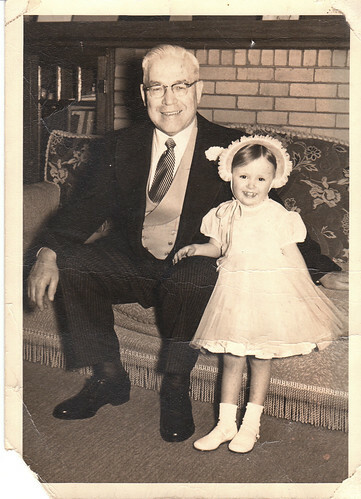 My grandpa’s warm cheek against mine was my only defense against the horror of realizing what bad things my own species was capable of. He told me that killing animals isn’t wrong—all the meat we eat comes from animals. What seemed wrong to him was killing more than anyone could possibly use, and finding it fun. I don’t think my grandpa thought hunting was wrong, though he never owned a gun and I think was unable to fathom killing anything for sport after his experiences in World War I. It was on his knee that I formed my moral code, which is probably why avarice—that lust to possess more than one could possibly use—seems to be a sin of the highest order. 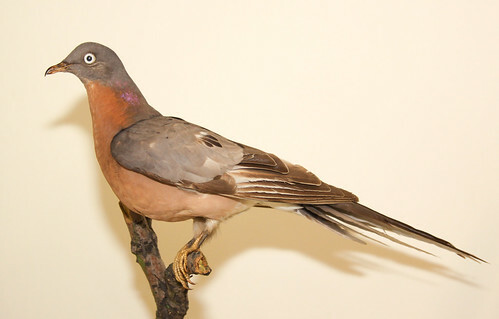 This year marks the 100th anniversary of the death of Martha, the last Passenger Pigeon on the planet. And we’re getting new information again focusing on the excessive, avaricious over-hunting of the species, along with an exhaustive treasure trove of authoritative information about the species and how habitat loss and other factors also contributed to its demise, thanks to an extremely important book published this month by Bloomsbury. The London office of this publishing house was the first to discover J.K. Rowling, publishing Harry Potter and the Philosopher’s Stone after a dozen publishers had rejected it. Now the New York office of this same publisher has released a natural history book that I’m hoping against hope will do just as stupendously. A Feathered River Across the Sky: The Passenger Pigeon’s Flight to Extinction was written by Joel Greenberg, a Chicago researcher associated with some of my absolute favorite institutions: the Field Museum of Natural History, Morton Arboretum, Brookfield Zoo, and Chicago Botanic Garden. His book is an in-depth look at one of the great ecological tragedies—perhaps the greatest ecological tragedy—in the history of mankind: the extinction of what was not very long ago the most abundant land bird in the world. A Feathered River is about the willful destruction, by humans, of a species that provided food for millions of people as well as most likely one of the major food sources for Peregrine Falcons. Considering the tragic subject, Greenberg’s book is surprisingly fun to read, filled with fascinating historical accounts unearthed in his exhaustive research. His chapter titled “Pigeons as Provisions to Pigeons as Products” includes quotes from a debate in the Indianapolis Star between a Kentucky author who found Passenger Pigeon meat “as tough as whit leather, about as juicy as a pith of a dried corn stalk, as digestible as rawhide and almost as hard to masticate as rubber,” and two pigeon meat defenders, one who said you could say the same for beef or chicken if all you had tasted was an old bull and a four-year-old rooster, and another who claimed she “never ate a pigeon of any age that was not delicate and delicious.” Pigeons were stewed, served in pies, boiled and pan fried, “as you would squirrels.” When Charles Dickens was feted at New York’s City Hotel with such luminaries as Washington Irving, he was served stewed pigeon with mushrooms and peas, and pigeon patties with truffles. President Andrew Johnson and General Ulysses S. Grant were served pigeons at the famous Delmonico’s. The book’s clear-eyed exploration of what we know and what ornithologists speculate about Passenger Pigeon natural history is utterly fascinating, and Greenberg carefully teases out the truth from fiction in various accounts of the species and its extinction. We learn about the people who took part in the unconscionably excessive slaughter, people who tried to slow it down, and people, including avid pigeon hunters, who became passionate conservationists because of it. Throughout, Greenberg writes in a simple, straightforward way as if channeling E. B. White, leavening the depressing with the fascinating. This post-mortem on a species that has been extinct for a full century is far more than just an insightful but sad look back. Greenberg’s final chapter is titled “Extinction and Beyond,” where he discusses issues facing birds today, giving an overview of many of the issues I tackled in my 101 Ways to Help Birds. When I was in college on that first Earth Day in 1970, people of all ages seemed so certain we could effect real changes, and sure enough, within the next four years we’d passed the Clean Air Act, Clean Water Act, and Endangered Species Act, and even passed the law lowering the speed limit to 55 to save natural resources. But ever since, corporations and developers have been firmly committed to gutting each of these laws and limiting their enforcement, and more and more people have bought into the idea that there is too much regulation, leading to the situation today in West Virginia where thanks to lax regulation and enforcement, a chemical spill has contaminated the water supply of hundreds of thousands of people (to say nothing of fish and wildlife). I’ll never understand why it is that we consider the corporations that pollute to be “job creators” while those who would help clean up and prevent messes and protect our wildlife are not. … mark this anniversary and promote the conservation of species and habitat, strengthen the relationship between people and nature, and foster the sustainable use of natural resources. The project aims to engage a broad audience through a documentary film, a new book on passenger pigeons, this website, social media, curricula, and a wide range of exhibits and programming for people of all ages. So far, over 150 conservation and education organizations have become supporters. His wonderful book serves as a major kickoff for this superb effort. I’ve never before wanted a third hand, but I wish I could sprout one just so I could give this book three thumbs up. It doesn’t just pack a punch—it packs a punch to the head, the heart, and the gut. Greenberg’s Feathered River across the Sky: The Passenger Pigeon’s Flight to Extinction is one of the most important books I’ve ever read. This entry was posted in Uncategorized on January 14, 2014 by Laura Erickson.